The Print and Page Setup window provides control over the printing of a document. Click the Printer Properties button to access additional settings, such as paper size, paper bin selection, etc. General: The panel of general printer settings. Page Margins: The panel used to set document page margins. Header & Footer: The panel used to define a document's header and footer lines. Print: Prints the currently active document to the selected printer. Preview: Displays the Print Preview window showing the current document. OK: Accepts any settings changes and closes the window, but does not print the document. This is useful if, for example, you want to change the document's page margins but you are not ready to print the document yet. Cancel: Discards any settings changes and closes the window. Number of copies: The number document copies to be printed. Collate: If checked, all pages of the first copy are printed first, followed by all pages of the second copy, and so on. If not checked, all copies of the first page are printed first, followed by all copies of the second page, and so on. This setting is only enabled when more than copy is requested. Select the desired printer from the list of available printers. Printers are configured in the Printers section of the Windows Control Panel. Printer Settings: Displays the printer settings window associated with the selected printer. The desired paper size, among other settings, can be selected in the printer settings window. Note that the content and format of the printer settings window is dependent on the printer selected. Print all pages: Indicates all of the pages in the current document are to be printed. Print current page: Indicates only the current page in the current document is to be printed (i.e., the page currently containing the text cursor). 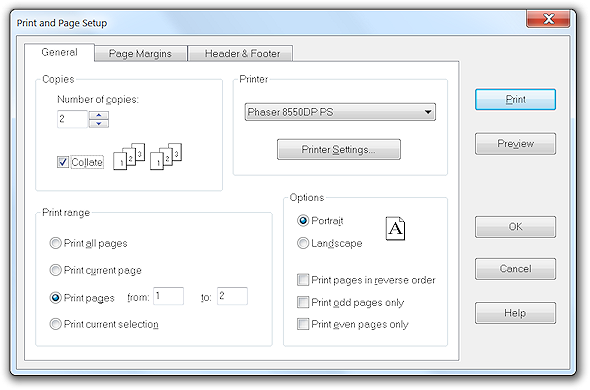 Print pages: Indicates the specified range of pages is to be printed. Print selection: Indicates only the currently selected text in the current document is to be printed. This setting is disabled if no text is currently selected. Portrait: Indicates the document is to be printed with the paper in its normal orientation. Landscape: Indicates the document is to be printed with the paper turned 90° from its normal orientation. Print pages in reverse order: Indicates the document is to be printed beginning with the last page and ending with the first page. Use of this setting results in the pages being dispensed from the printer in their proper order on some printers. Print odd pages only: Indicates only the odd pages from the specified print range are to be printed. This setting, together with the Print even pages only setting, allows you to perform double sided printing on printers that are only capable of single sided printing. Double sided printing is accomplished in two passes by first printing only the odd pages. Load the printed pages back into the printer such that the printer will print on the blank side of the pages. Then print only the even pages of the document in the second pass. The result is a double sided printout of the document. Print even pages only: Indicates only the even pages from the specified print range are to be printed. See the description above of Print odd pages only for more information.